Pac Man has been cloned in many different ways. It’s often said, however, that despite all the different versions, the original remains the best and nothing’s going to top it. One thing’s for sure, the new “DX” version of Pac Man certainly doesn't. Anyway, that’s a whole different article and story and in no way helps set the scene for Munch Man. 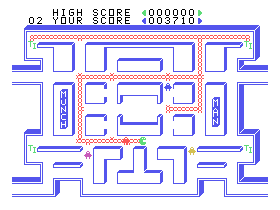 Munch Man was the TI99/4A’s version of Pac Man, and is, in my humble opinion, just as good as the famed game, although in quite a different graphical style. First off, gone are the dark backgrounds of most games of this genre, and in comes a bright white background. Gone are the dots to eat, instead you have to make a chain round the maze (until later, anyway). You still have your power pills, though they're shaped like Texas Instruments logos. The ghosts are replaced by "Hoonos", baddies that come in a variety of shapes and speeds. Graphics are colourful, and the animation is simplistic yet effective. The sound effects are marvellous, especially the satisfying "crunch" as you eat one of the Hoonos. As far as gameplay goes, it's no more complicated than Pacman, but just as fun. 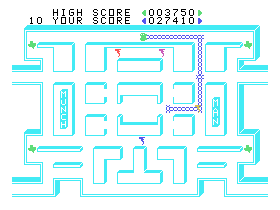 The speed of the game starts off alright, but increases steadily to a stern test of nerve, especially when you reach the last couple of levels in the loop... rather than having your visible maze and filling it with chains, now the walls are invisible, but paths are marked by tiny TI logos that you must eat. Unfortunately, as you eat these logos, you take away your map, leaving you reliant on your memory as to where the paths are. Let me be honest... if you're a Billy Mitchell type who can deliver a perfect high score on PacMan, you're NOT going to find this overly challenging. However, a regular everyday joe like most of us will find Munch Man a refreshing and fun alternative to everyone's favourite yellow ball. The further you get, the faster the game is, so the challenge is constantly increasing. One last thing... the game contains one of the earliest known "Cheat" modes. At the start screen, before the title animation begins, if you hold the Shift button and type "838", you can select what level you want to start on and how many lives you have. Thanks to emulation, you can get hold of this game to play within moments, which I've tried, but I have to be honest... I still prefer the real thing every time. Commodore Amiga - Yo! Joe!